Considering that Élet és Irodalom is a subscription-based publication, which limits its accessibility, I thought I should summarize the article so that readers of Hungarian Spectrum can see what is considered to be unacceptable historical scholarship in extreme-right circles. It is a historical commonplace that nationalism and the idea of the nation state are relatively new phenomena. Before the eighteenth century the organization of society was based on a feudal hierarchy, at the top of which was the king who at least in theory “owned” the land that he considered his domain. His subjects were loyal to him personally, not to the nation. In the late eighteenth century all that changed and with it came “nationalized” historical scholarship. It was at this time that the concept of the House of Árpád emerged. Two members of the Jesuit school of Hungarian historiography, György Pray (1723-1801) and István Katona (1732-1811), coined the term “House of Árpád” to refer to the kings who ruled the Kingdom of Hungary between 1000 and 1301. What did the twenty-three kings who reigned between these two dates actually call themselves? Simon Kézai in his Gesta Hunnorum et Hungarorum (circ. 1282) calls them the Clan of Turul (de genere turul). As far as we know, the members of the House of Árpád called themselves “the family or clan of the saintly kings” because there were indeed many. The list is quite impressive. Hungarian historiography of the eighteenth and nineteenth centuries considered the House of Árpád to be a Hungarian dynasty as opposed to the dynasties that followed: the Anjou, the Jagellonian or the Habsburg. The distinguishing criterion they invoked was linguistic. In the first half of the nineteenth century being Hungarian primarily meant that Hungarian was one’s mother tongue. The whole Reform period–the three or four decades before the 1848 Revolution–was accompanied by linguistic reform as well. The reformers wanted to build a cultured nation by making the language capable of transmitting modern western ideas. Language is, however, a flawed criterion of what it means to be a Hungarian. Even a foreigner could become a Hungarian if he identified with the national cause. Take, for instance, the thirteen generals who were executed in Arad on October 6, 1849. Among them were several whose mother tongue was not Hungarian, but today they are considered to be Hungarian patriots who died for the national cause. By the twentieth century the notion arose–a notion with horrific consequences–that belonging to a nation was tied to ethnicity. A true Hungarian would be an ethnic Hungarian. By either of these criteria the House of Árpád wouldn’t be genuinely Hungarian. First of all, Hungarian kings, just as their counterparts elsewhere, married foreigners. Marriages were arranged on the basis of foreign policy considerations. 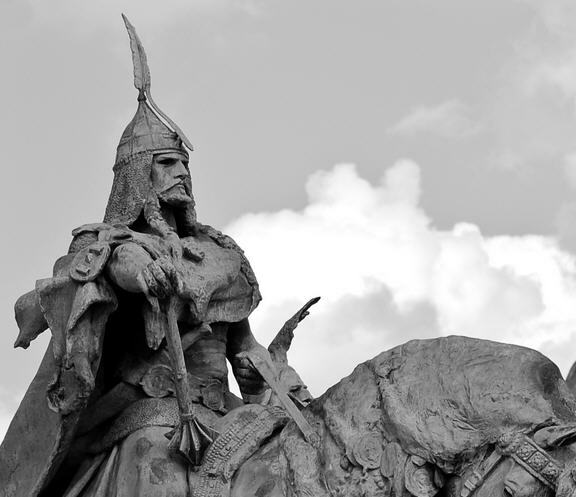 Gerő couldn’t find one “Hungarian” spouse among the Árpád kings. So, as far as ethnicity is concerned, they were a very mixed lot. And, as far as their language is concerned, it is unlikely that they were monolingual. After all, their mothers came from all over Europe and usually with a large entourage. Some of them spent considerable time abroad. Péter Orseolo, the successor to Stephen, in Italy; Géza I in Poland; Béla III in the Byzantine Empire. The kings of the Árpád dynasty were Hungarian kings in the constitutional sense; that is, they were the rulers of the Kingdom of Hungary. But so were the Anjous, the Jagellonians, and the Habsburgs. Yet in Hungarian historiography the House of Árpád was long considered to be more “national” than the other dynasties. After the communist takeover, Marxist historians pretty well excluded “the nation” from consideration and concentrated on class struggle and economic conditions. In consequence, the description of the Árpád dynasty as a national dynasty disappeared from historical dialogue. And after the Marxist interlude in Hungarian historiography, as historians delved deeper into the Middle Ages, they saw no compelling reason to revive the concept of a national dynasty. But even though mainstream historians find the notion of a national dynasty intellectually indefensible, proponents of “alternative history” embrace it wholeheartedly. For these people, who are not really historians or just marginally so, making the kings of the House of Árpád true Hungarians is very important. These “Hungarian kings” worked for the good of the country, whereas the foreigners by and large set out to ruin it. The worst culprits were the Habsburgs, whom one such author, Lajos Darai, accuses of wanting to obliterate the Hungarian past. Others claim that there were “secret forces” that stood behind the Habsburgs whose intention was to make Hungary a colony of Austria. “For four hundred years the crowned heads of Hungary fought a war against the Hungarians.” The implication is that these secret forces were manipulated by Jews. The practitioners of alternative history unfortunately are making headway in Hungarian right-wing thinking. The spokesmen for the “us and them” theories don’t even leave the early kings alone. These kings are forced to play a role in the “nationalized” history of the new Hungarian far right. My favorite is Béla II (12th century). The dude was blinded when he was 7 due to some usual power struggle. This didn’t stop him to make 6 kids – pretty much fathered the whole Arpad House. He was bloodthirsty animal and a big time alcoholic. He died when one day fell off his throne stiff drunk. The British Royal family has strong Germanic roots. The House of Windsor is a recent creation yet it is considered to entail all that is British. Even the Brits cannot boast of a crown that is more than a thousand years old. No wonder we look at Árpád with misty eyes. While some look at the far away past with misty eyes, the Orbán orbit is filling its pockets. BTW my friends in Britain (including my sister’s English husband) are very strongly opposed to the monarchy – I can’t tell you what they call those Windsors …. And the difference is, Joe, that even the most ardent monarchists in Britain are not in ridiculous denial about their beloved Windsors’ geographical and cultural origins. True, but you have left out an important step. The mediaeval notion of the nation – which was based on the three “estates;” i.e. a small minority of the country’s inhabitants – did not give way to the ethnically defned nation concept straight away. In 19th-century Hungary, the most progressive minds believed in the so-called “political nation.” This was a wide, all-encompassing nation concept that represented a huge step forward in comparision to the mediaeval notion of the nation, as it practically included everybody living within the boundaries of Hungary, regardless of their ethnicity, mother tongue or social status. Ferenc Deák said: “In Hungary, there exists [only] one political nation; the united and indivisible Hungarian nation, in which all citizens of the homeland, regardless of what ethnic group they may belong to, hold equal membership.” This was an excellent, forward-thining idea, but alas, it was woefully incompatible with the dominant idea of the age – that of the ethnically defined/determined nation and the nation state. This was actually a Western concept that unfortunately became rather popular in Central Europe too, resulting in a number of nationalistic movements among Hungary’s ethnic Rumanians, Serbs and Slovaks; as well as the rise of Western-type nationalism within the Hungarian elite itself, which tried to counter these movements with excessive and ultimately counter-productive “Hungarianisation.” The desire to apply the Western concept of the (ethnically defined) nation state to the ethnically diverse Carpathian Basin was one of the reasons behind the tragedy that befell the region with the Treaty of Trianon. Koves cannot be voted out. Feldmajer was a lay leader of the Neologs, Koves is a Chabad rabbi. Well now, it would have been a proper royal house if they married their siblings…..marrieg for political purposes was the routine all over Europe (and most likely elsewhere) there is nothing that shorts the House of Arpad in that aspect. Although marriage to Scottish kings may not have been political….perhaps this way they got the Whisky franchise….but it got several Hungarian oble,eninto the Scottish clans. Everybody is involved in reverse history making based on partial facts and a lot legends…of those perhaps the Bible is the worst. In my opinion that the Habsburghs did not ry to homogenize Hungary into Austria is believed only those who are strongly prejudiced….toward Hungary and Hungarians.. I am also wondering why it is of such relevance today whether the Habsburgs were the worst, or whether the Arpads or turuls were purely Hungarian dynasties. In general it should be of irrelevance if an author with such credentials searches for the “true name” of some other historian. (Such person could also be addressed by “Yes, Mr Napoleon” in a care home specifically designed for people with such visions.) I do start to share the impression that the debates are getting more and more off the track. Perhaps the most important issue is a programme for today’s Hungary, and in particular as step zero, a basis for debate between the people more at the centre of the political spectrum. Off track, but where does the debate happen? Hungary appears to be fairly unique in having no shared forum whatsoever in any media, in addition to a leader who has not indulged in public debate since he lost one on television many years ago (and with it, an election). So where does the debate happen? MTV? Lanchid radio? Magyar Hirlap? Demokrata? Nepszava. While media in all countries is politically allied to some extent, in Hungary it is exclusive. Meanwhile, I received (as I presume everyone did) a wholly misleading glossy brochure from the government today, full of curiously spun stats and pictures of happy families, workers, babies etc. Hungary looks great in this Kormany Informacio publication. I must be wrong. Sorry. unrelentingly good. Hey, she said, I didn’t know we’re so well off! She now wants to read only Nemzet and suggests I do the same. By either of these criteria the House of Árpád wouldn’t be genuinely Hungarian. There isn’t necessarily a contradiction here since a lot of the European nationalist thinkers of the XIXth Century did not consider ancestry to be a worthy criterion. Being a “true national” was determined on a political basis, not a biological one. By political basis I mean a set of beliefs and social behaviors that could not be discussed: you either displayed them (and were a “true national”), or didn’t and were to be discriminated against at some point – especially as those beliefs and behaviors were considered to be a sign of the historical permanence of the nation. What happened in Germany – where the racial madness and its obsession with ancestry took over the nationalist movement – was quite the exception. Don’t forget to kill all the resistance. It will lead to a friendly dead silence to please the great leader. You certainly show sympathy for the disabled. It would have been better if there were more Hungarian kings like him. During his reign he stopped foreign invasions. His foreign policy was excellent in inciting neighbors against each other, rather than spilling Hungarian blood. He was evidently a believer in female equivalency by having his wife as a co-ruler. He initiated the court chancellery, perhaps because of his sight limitation, but regardless of why, it was the beginning of written court records. Some of the property transfers recorded in his regime are the best lists for names of folks who lived in various parts of Hungary (Domos, etc. ), the analysis of which is rather interesting for those who analyze names. Regarding his drinking, if it was really so and not only taken from then equivalent Hungarian Spectrum, if a drunk king acts that way we should have required all of them to drink more. We’re just watching the M1 news – horrible crap! I hope this is not a sign of things to come …. You certainly show sympathy for the disabled. It would have been better if there were more Hungarian kings like him. Told ya! He was awesome! Bajnai shouldn’t worry about FIDESZ, but I would,not be surprised if I read that geese attacked him, like the donkeys the motorcyclist…..